Karlsson’s Gold Vodka is an excellent example of a great vodka that has unique character and taste. Made from a blend of Swedish ‘new potatoes’, Karlsson’s Gold Vodka has rich creamy mocha notes along with nicely balanced black pepper. Karlsson’s gets its flavor from a blend of seven different kinds of Swedish ‘new potatoes’ including Solist, Gammel Svensk Röd, Princess, Sankta Thora, Hamlet, Marine, and Celine. Last year, Karlsson’s released their first batch of vodka using only one potato from their blend, all harvested in a single season. 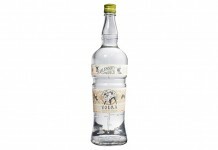 This first limited release, Karlsson’s Batch 2008 Vodka, was made solely from the Gammel Svensk Röd potato, and it captured the crisp potato and white pepper notes that appear in the Karlsson’s Gold blend. Putting out vintage batches of vodka may be absurd to some, but Karlsson’s is making an important statement about how not all potatoes make the same vodka and how seasonality does impact the finished product, even with a vodka. 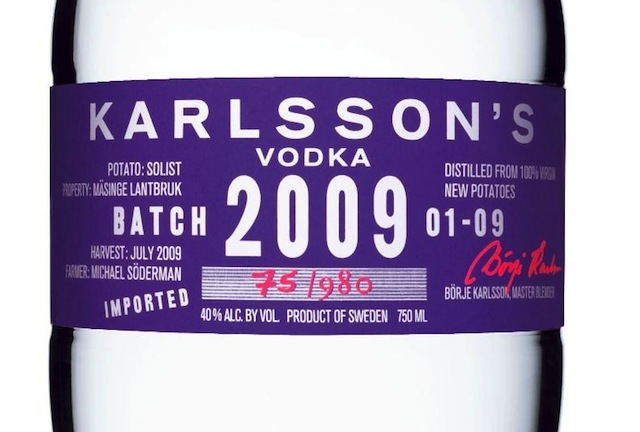 Karlsson’s Vodka Batch 2009 (80 proof / 40% ABV, $80) is made from the 2009 harvest of the Solist potato from the Cape Bjäre region of southern Sweden. 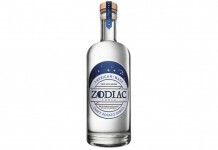 Only 1,980 bottles were produced of this vodka, making it a very limited edition. From the nose, the Batch 2009 is distinctly different from both the Karlsson’s Gold and the 2008 batch. Batch 2009 has a sharper quality to it, with crisp new potato, vanilla, and black pepper. 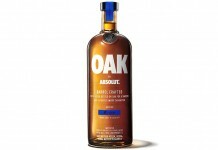 The nose is an interesting balance between sharp and slightly spicy high notes and sweeter, creamy lower notes. The entry follows the nose fairly well with light vanilla, new potato, and distinct black pepper. There’s also a grappa-like quality to the spirit, the edge you typically get from distilling grape skins and stems. The black pepper ramps up in the midpalate along with the addition of white pepper, although it still manages to maintain a nice balance between the creamy and spicy notes. The finish is quite long, spicy, and slightly dry with vanilla and black and white pepper sticking around for quite some time. Karlsson’s Vodka Batch 2009 isn’t as chocolately or as lush as the Karlsson’s Gold or the Batch 2008, and it’s considerably spicier than both. It’s clear from Batch 2009 what the Solist potato brings to the mix when blended in Karlsson’s Gold. On its own, however, it’s slightly less pleasing than the Gammel Svensk Röd. Given its high price and scarcity, Karlsson’s Vodka Batch 2009 is probably only really going to be bought by potato vodka enthusiasts, and perhaps even only by fans of Karlsson’s Gold. Regardless, it’s an interesting release that continues the conversation about terroir, seasonality, and their impact on spirits. Vodka isn’t often taken very seriously by the beverage connoisseur market, and so we applaud Karlsson’s for making an annual convincing argument that vodka deserves the same level of critical attention as other spirits.